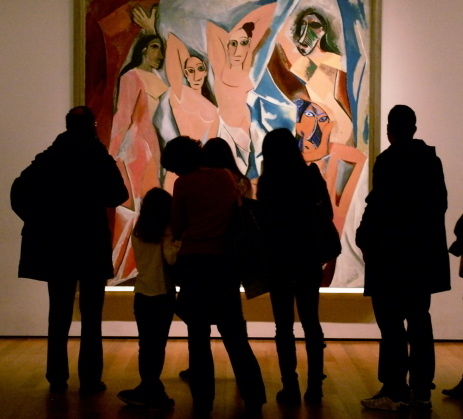 As museum educators, we’re always trying to get visitors to slow down, but sometimes we have a more immediate task, convincing them that they are in fact looking at a work of art. 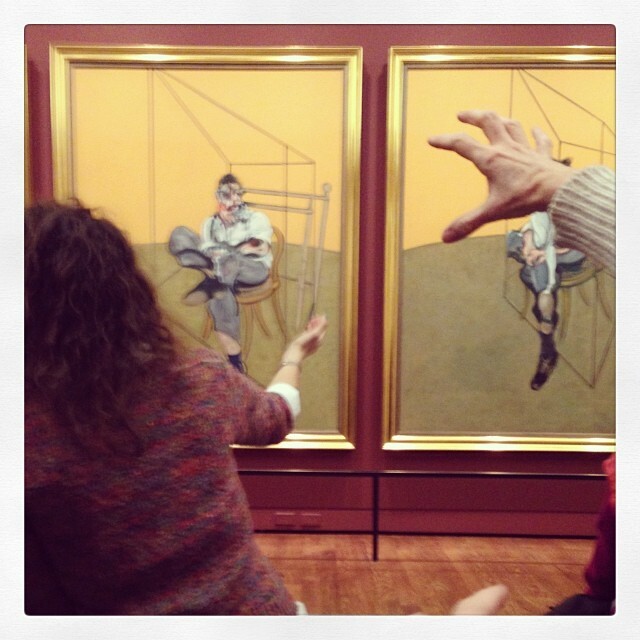 Recently three New York City educators got together and talked about the most common “Is this art?” situations we’ve encountered. Before you stop reading, let me acknowledge – yes, I have chosen a cliché. My intention is to use Pollock as a stand-in, a canonical example, of any number of more process-based works. For instance: Kazou Shiraga’s slippery barefoot paintings, Zarina’s meticulous Pin Drawings, Franz Kline’s definitive brushstrokes, or even John Chamberlain’s crunched-up cars. These works often challenge viewers’ preconceptions about what kind of art they will (or should) see hanging on the walls of the museum. The responses vary, ranging from “My four-year-old could do that” to “It looks like scribble-scrabble, finger painting, a car wreck, a big mess.” Or the hardest response for an educator to field: the uncomfortable polite silence punctuated with a quick roll of the eye or a smirk shared between friends. Once uttered, perhaps coaxed forth, responses invariably question the artist’s skill and the overall value of the artwork. (Confession: I still have to take a deep breath and remind myself not to get annoyed when a visitor sneers and likens an artist to a four-year-old, insulting some of my favorite children as well as some of my favorite artists.) In fact, these comments are often coming from visitors who feel affronted by the unexpected and are responding defensively. Many of the initial comments a Pollock (or any process-based work) elicits refer to how the painting was made – and also often indicate a hesitation to accept the work as art. Though stated defensively, these comments are not entirely off base. I think it’s important to first acknowledge and accept the hesitation. That’s something I love about museums. There is always some artwork that makes me uncomfortable, that challenges my own definition of what art can be. In his time, Jackson Pollock was pushing the envelope; with his artwork, he was asking questions about how art should look and how art can be made. Conversations in museums, thankfully, are not meant to appraise the quality of the artworks viewed, but rather to unpack the inherent ideas. 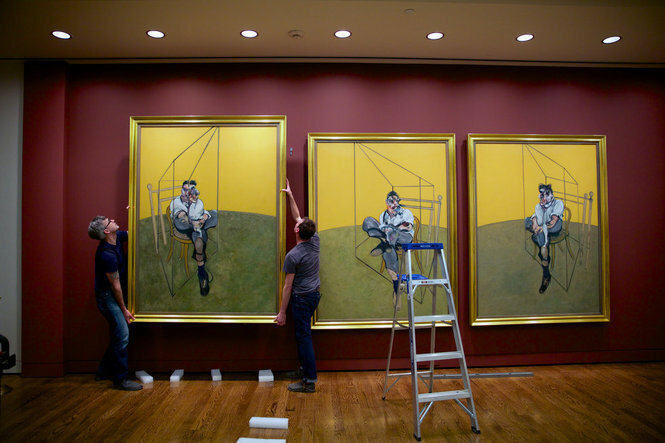 After recognizing the broader questions of value and defining art, leaving them open for discussion, I would want to ground the conversation in the artwork at hand. For Pollock, I would want to return to the implicit observations made in the initial comments and how they relate to the creative process. What about the painting makes it look like scribbling, finger painting, a mess? Where, specifically, in the painting do you see that? The ensuing conversation will vary, depending on who is taking part and what the original comments were; any number of approaches could move the discussion forward. I might show some of Pollock’s earlier and more representational work from his years with the Art Students League. Looking at the two works side by side silently states that the abstraction is a choice, not a matter of ability. I might ask the group how the two would be different to make. Or I might share that Pollock lived with his wife Lee Krasner in a farmhouse on Long Island. He would spread his canvases out on the floor of his large studio, and using brushes, sticks and sometimes a turkey baster loaded with house paint, he would begin to squirt, pour and drip onto the floor. I might ask the group to see if they can identify the painting’s starting and ending points. 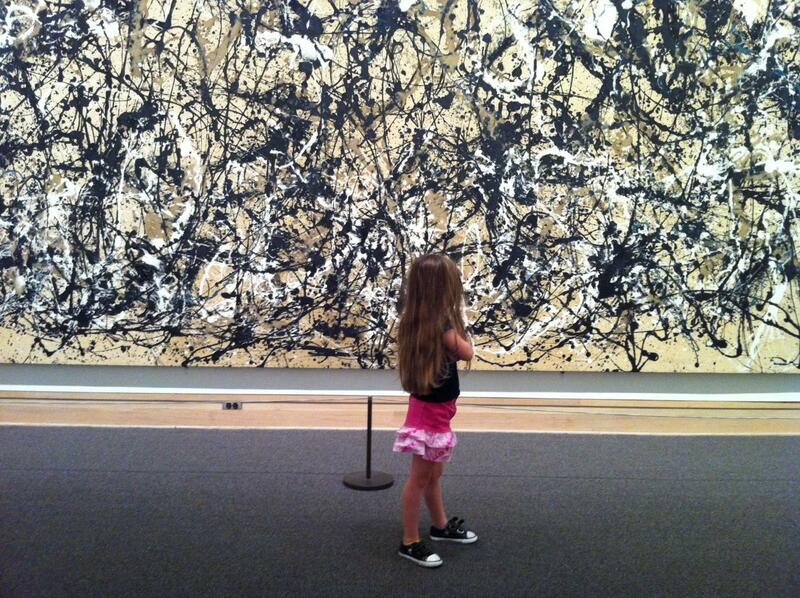 Alternately, I might ask the group to envision a four-year-olds drawing and compare it to the Pollock – how do the two differ, and what do they share in common? The differences found in the all-over painting style may point to Pollock’s control of the paint and academic knowledge of composition. The similarities, however, might allow for greater understanding of Pollock’s process and more nuanced interpretations of his work. In fact, the response “my four-year-old could do that” may be more insightful than the participant (or educator) realizes. Four-year-olds, still learning language and ways to interact with other humans, often express themselves physically. Anger is communicated through clenched fists and stomping feet; sadness, through a down-turned glance or the curl of the spine. And sometimes, it just feels good to run. For a four-year-old, movement is a primary means of engaging with the world. Likewise, Pollock chose to engage with the canvas through movement. Rather than communicating through recognizable images, he dripped, dribbled, spilled and splattered the paint in a dizzying dance across his studio floor. The painting we see can be read as the aftermath, a record of the artist’s intuitive physical expression. 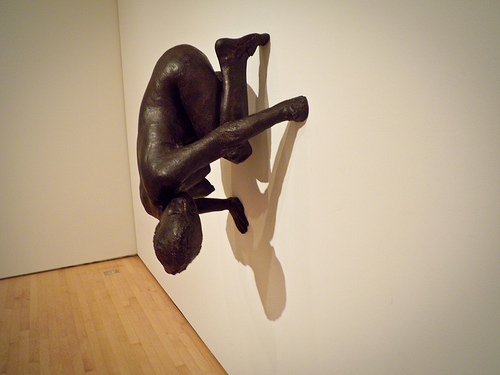 A more recent work by Kiki Smith entitled “Lilith,” 1994, Metropolitan Museum of Art. Photo by Smath. Aesthetics are subjective, and much art can be overlooked because it is not outwardly ‘beautiful.’ Having the experience of teaching with classic and modern art, I’ve heard the “pfft, that’s disgusting” in front of works not traditionally ‘beautiful’. While it’s fairly easy to call a floral Rococo work ‘beautiful’ and ‘art’ – what about a gritty Kiki Smith? My goal as an educator is not only to have visitors appreciate craft in a work that isn’t traditionally ‘beautiful,’ but also to understand the art AND beauty is often in the idea, as well as the work. Kiki Smith’s Tale encompasses that very balance. Smith is known for her representations of the body, usually altered in gasp-inducing ways. Tale is a sculpture of a woman crawling on the ground with a long trail of feces (fake) following behind her – admittedly, a bit cringe worthy, even for the savviest of art viewers. and easily something a visitor could dismiss as disgusting. But when examined closer, the work, like all of Smith’s body works, is brilliantly complex. Just those brief questions and an artist quote allow the work to gain a life – and let people stop and think about the ideas behind a work of art. Everyone has personal ‘garbage’ and that new connection between art and life is exposed with Smith’s quote. The work becomes an experience and the idea behind it becomes intriguing, thought-provoking and even beautiful. Yes, Ikea sells beautiful paper lanterns, and it’s jarring to see a similar object in a museum. Isamu Noguchi’s version of the paper lantern, the Akari, has been knocked off since he began designing them in the early 1950s. I frequently meet visitors who get snarky upon seeing one during a tour. They are understandably suspicious of my “tour,” especially if it ends at the gift shop where they can purchase an Akari. Yet, this is the very reason why I love the Akaris. You can take a sculpture home. If you don’t actually want one, the concept alone is worth investigating more — high art specifically made to be affordable. I understand how some of the mystique can be lost when it’s possible to take home the work of art, especially when it comes with an on/off switch. As an educator, I invite visitors first to consider how the Akari is different from the Ikea lamp. If the soft glow of the handmade paper doesn’t capture them, I invite them to look inside and inspect the hand-crafted bamboo armature. Then, I like to share the story of the object to place it in a historical context. Akaris were conceived in 1951 when Noguchi was visiting a small town in Japan called Gifu. The mayor of the town asked Noguchi to re-design the traditional paper lantern. 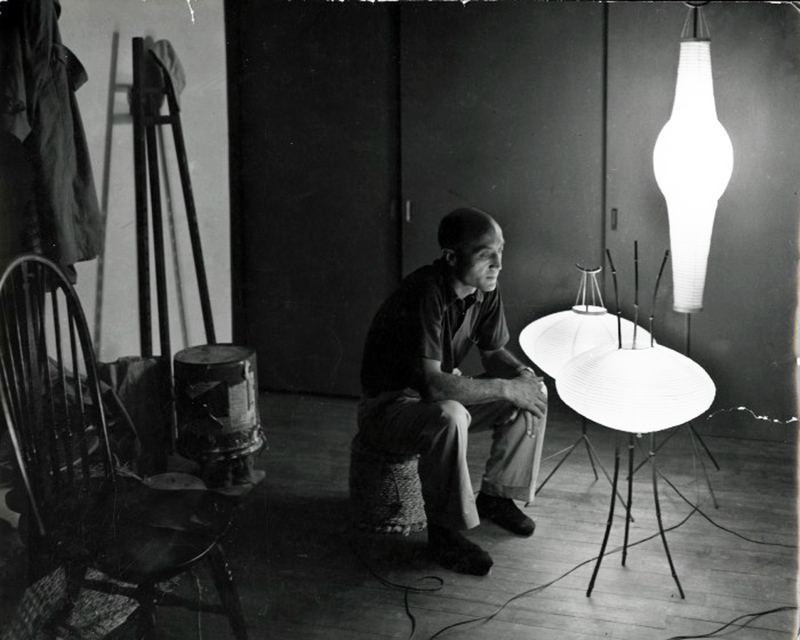 Noguchi went to work and designed hundreds of Akaris in various abstract shapes. The story continues for decades as Noguchi struggled to exhibit Akaris as fine art, while still selling them at a reasonable price. The struggle is often said to have cost him a Grand Prize at the 1986 Venice Biennale where he insisted on exhibiting the Akaris along with his stone and metal sculptures. Much to Noguchi’s dismay, the Akaris were stuck in a realm of applied art. Sometimes, the artist’s words resonate with visitors. Noguchi said “Call it sculpture when it moves you so.” The Akaris were, “the one thing I’ve done out of pure love . . . nothing to do with commerce.” Saying the word “love,” while looking at a glowing light and knowing there was a history of struggle wins visitors over every time. Money! And then with a wry smile, I remind my group that the Akaris are sold downstairs in the shop. I tell them that it won’t last forever, the paper will one day begin to turn and the bamboo will give. Its authentic beauty does last for many years though, and it could be the last thing you see before you go to bed every night. Try that with Starry Night. 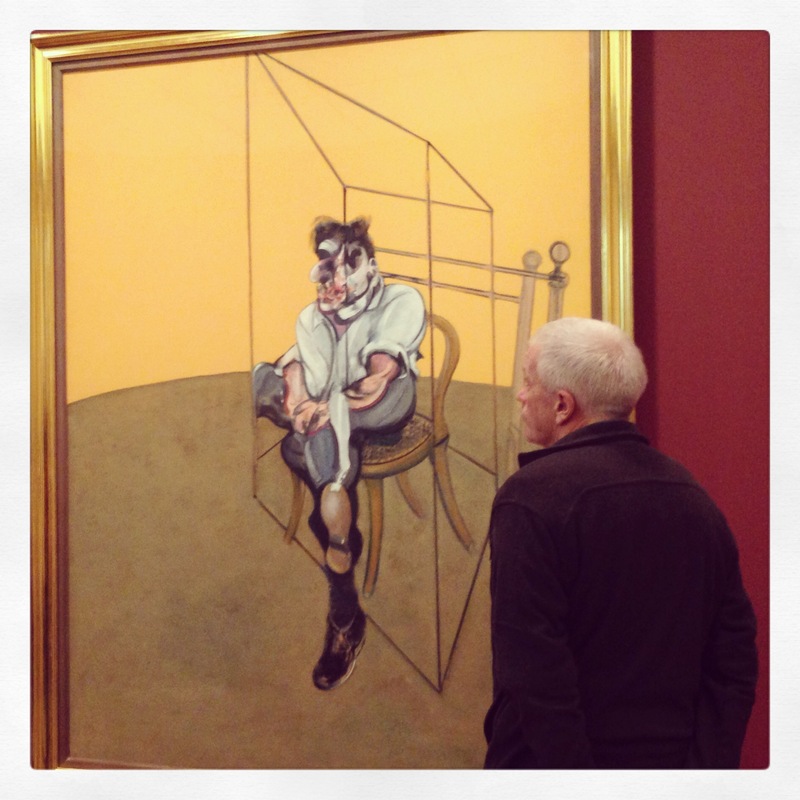 Which objects do you find people asking “Is this art?” How have you handled it? We’d love for everyone to share their stories here. 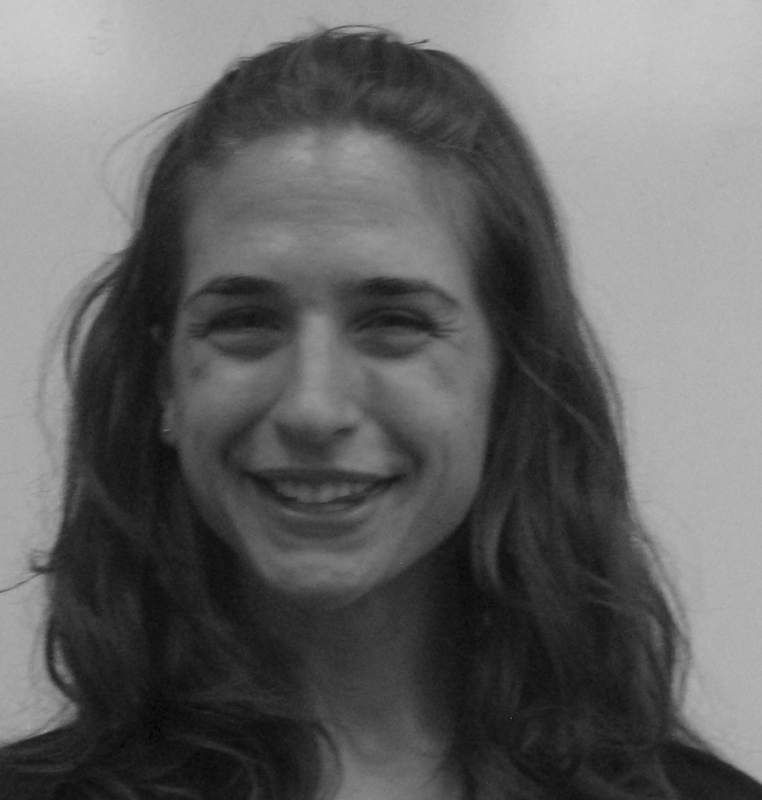 JEN OLENICZAK: Founder of The Engaging Educator, a NYC-based organization that specializes in theatre, improv, and movement workshops and professional developments for educators. With a dual background in art history and theatre, Jen is also a museum educator, trained actor, and improviser. She’s worked as an educator with the Guggenheim Museum, Metropolitan Museum of Art, MoMA, Brooklyn Museum, The Frick Collection, Noguchi Museum, and New York Transit Museum. Jen keeps herself busy performing with National Comedy Theatre and searching for new delicious food spots. 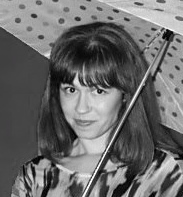 Jen’s postings on this site are her own and do not necessarily represent the positions, strategies, or opinions of the Noguchi Museum, the Guggenheim Museum, the Museum of Modern Art, or The Frick Collection.